Looking for a dentist in Toronto? 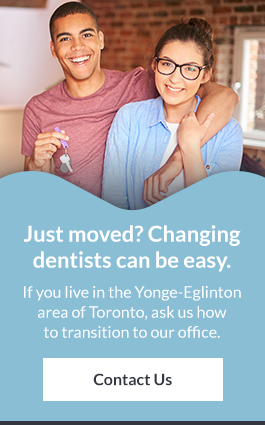 Our team of dental professionals is committed to making your first visit to Capitol Dentistry easy... and as our 'neighbours' in the Yonge & Eglinton community, you'll feel like part of our family too. At Capitol Dentistry, we think of our patients as extended family. It’s a great community. Over the years, we’ve noticed that a lot of our new patients ask many of the same questions. So, we decided to put them all in one place. We hope they help you prepare for your first visit! Typically, a first appointment with our team will take approximately 60 minutes. We encourage new patients to arrive a few minutes early to familiarize themselves with our clinic and to give us time to review the New Patient Intake Form. Why should I complete the New Patient Form before my first visit? The New Patient Form provides us with information we’ll need to create your dental profile and start charting your treatment plan. Please print off this form, fill it out, and bring it to your first appointment. Completing it in advance means that you can start your treatment immediately. We’ll review your dental care history, as well as any concerns you currently have about your oral health. We’ll perform a complete oral exam, including X-rays, in order to assess the overall health of your smile. If there is something specific that you would like to discuss about your oral dental care, please feel free to bring it to our attention during your first visit or any visit for that matter. We care and we’ll listen. At the end of your first visit, we will prepare recommendations for your total oral health, which will include full oral maintenance, as well as the potential of additional dentistry services that you and your doctor agree upon. We strive to keep all of our patients up to date and educated regarding their dental care to ensure you fully understand all of your dental care options.